Jill’s house contains several of my carpets. Although the house isn’t anywhere near finished yet, she’s obviously determined to get the carpets done as a priority! On the bottom flight of the staircase is an ‘Amy (red)’ staircarpet – the second floor has a ‘Carole (pastel)’ staircarpet. 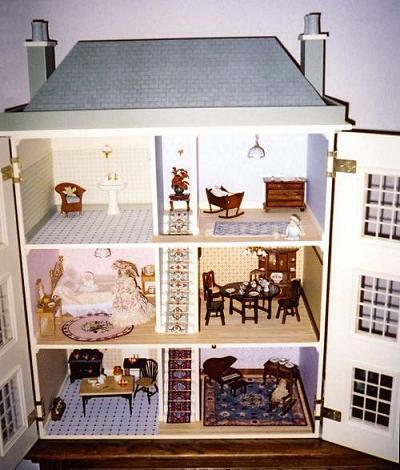 The pretty pink bedroom on the first floor features a round ‘Bella’ carpet, while the nursery on the top floor on the right has a ‘Veronica (blue)’ carpet. On the ground floor in the drawing room is an imposing ‘Elizabeth’ carpet. Jill changed the colours of this carpet slightly to match the colours in her wallpaper.